<br>Enter the world's wildest, craziest sports tournament and compete in some of the most outlandish games from around the globe, such as Tuna Tossing, Furniture Racing, Mud Sliding and more! Challenge a zany group of the world's most skilled Wacky Sport athletes in 10 off-the-wall events. 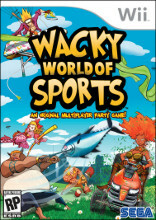 With Wacky World of Sports, the wide world of eccentric sporting events is delivered in an all-new, original Wii title that the whole family can play either in the single player Tour mode or four person multi-player!